The theory that abortion increases a woman's risk of breast cancer was debunked long ago. Why then does the claim still appear from bumper stickers to Crisis Pregnancy Centers to the Internet? The theory that abortion increases a woman's risk of breast cancer was debunked long ago. Why then does the claim still appear from bumper stickers to Crisis Pregnancy Centers to the Internet? Some zealots claim that, "The single most avoidable risk factor for breast cancer is... elective abortion." Indeed, one abortion foe alleges an international conspiracy of silence. Because of poor methods, early studies reached the wrong conclusion. When researchers study diseases that take long to develop, they routinely use a follow-back design called "case-control." Researchers gather a group of persons with the disease in question (cases) and ask them about earlier exposures in life, such as smoking, pregnancies, or work. The researchers then find a group of persons without the disease (controls) and ask them the same questions. 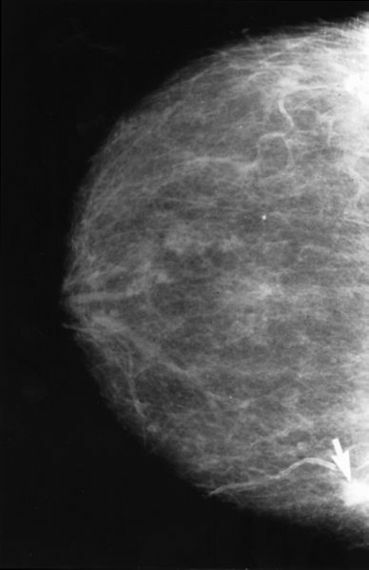 If a higher proportion of cases (here, with breast cancer) have an exposure than do the controls, then an association is said to exist. This relationship may or may not be causal. The validity of this interview research hinges on accurate recall of histories. While a woman with breast cancer is likely to search her memory for exposures that might be relevant, healthy women have no such motivation. Moreover, abortion is a personal matter that healthy women may be unwilling to disclose to researchers. The resultant under-reporting of abortion among healthy controls leads to a false association with breast cancer. 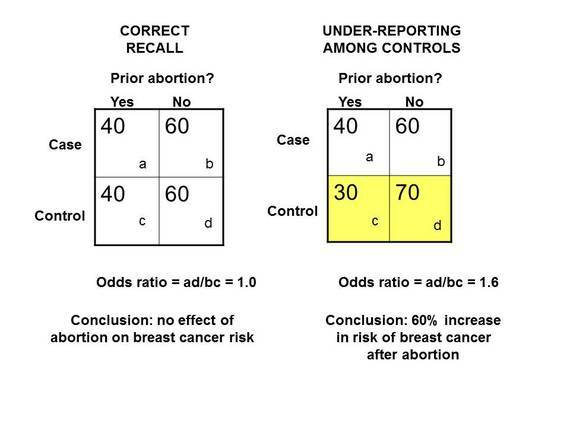 In the left panel above, 100 cases (top row) have breast cancer, and 100 control women (bottom row) do not. When asked if they had an abortion in the past, 40 in each group correctly responded "yes." However, in the right panel (which is more typical), all 40 breast cancer patients (top row) correctly recalled their prior abortion, but only 30 of the controls (yellow row) reported their abortion. Under-reporting of abortion among healthy women created a spurious increase in the risk of breast cancer (odd ratio of 1.6, when the truth is 1.0). Stated in another way, inaccurate reporting by just 5 percent of study participants caused an apparent 60 percent increase in risk! In a landmark study Swedish investigators did a case-control study of this question in two different ways: the traditional interview approach and reliance on government statistics. In Sweden, health care is provided by the government as part of citizenship, so the researchers had the ability to track both abortions and breast cancer diagnoses. The discrepancies between interviews and government statistics revealed recall bias among the healthy controls. Government records documented 59 healthy controls as having prior abortions; when the same women were asked face to face, only 44 women acknowledged this fact. The likelihood of a discrepancy this large being due to chance was less than 1 percent. Here was clear evidence of the under-reporting of abortion by healthy women leading to a bogus association. All case-control studies of this question that have relied only on personal recall are sabotaged by this inherent bias. Because of this persistent flaw, more than a score of early studies consistently got the wrong answer. Studies that confirm abortion history before the diagnosis of breast cancer reduce recall bias. A landmark prospective study of women in Denmark confirmed history of abortion before the development of breast cancer and found no association. A large meta-analysis (synthesis) of studies around he world with abortion history obtained prospectively found no association. Other recent studies have determined abortion history before breast cancer diagnosis. These include the Black Women's Health Study, the European Prospective Investigation into Cancer, and the large Nurses' Health Study from the U.S. In each of the major studies, no effect on a woman's risk of breast cancer was evident. Epidemiology is a blunt tool. In the early years of research on this topic, most studies reached the wrong conclusion because of the pervasive problem of recall bias among controls. In recent decades, large studies with better methods have provided conclusive, consistent evidence that abortion is unrelated to breast cancer risk. Moreover, all major medical and public health organizations that have reviewed the evidence have reached the same conclusion. To claim a link today reflects either a lack of understanding of medical research or intentional misrepresentation of it for ideological purposes. While the former excuse may be forgiven, the latter should not be.